The ability to switch on a light is something that many of us take for granted, but more than 20% of the world is left in the dark when night falls. With 1.6 billion people lacking access to electricity, few solutions exist for these often impoverished individuals to gain access to lighting that is affordable, reliable, and above all, safe. Recently, Artist Olafur Eliasson and innovator Frederick Ottesen released Little Sun, a portable solar-powered lamp capable of providing five hours of continuous light. While the little lamp is being distributed for use worldwide, Eliasson decided to join forces with the Tate Modern Museum in London to promote the new lighting innovation to the public. In an interactive exhibit where art meets technology to improve living, the aptly dubbed ‘Tate Blackouts‘ invite vistors to experience art in the Tate‘s suite of surrealist galleries using only the Little Sun lamps to light the way. While the lamps are being used far from their ultimate recipients, their use in this forward-thinking art exhibit poignantly provides a vehicle for the more fortunate to internalize what it means to live with little or no access to electrical lighting. We recently visited the exhibit in London — see some of our photos ahead and learn more about how Little Sun has the potential to bring new light and raise living standards for more than a billion people worldwide. Olafur Eliasson developed Little Sun with the help of engineer Frederick Ottesen. 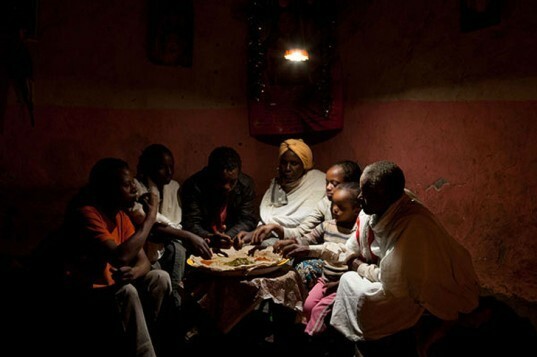 The goal of their project was to focus attention on solar light and its power dramatically improve lives. 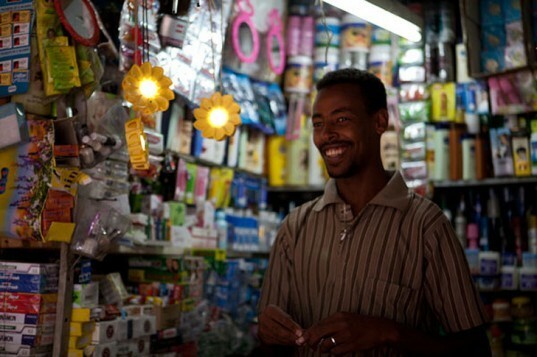 Of the 1.6 billion people who live without access to electricity, many of them rely on kerosene lanterns for lighting. While easily obtainable, kerosene comes at an extremely high cost. Not only is it expensive, but its use carries with it the threat of fire, the potential of acute respiratory infections and other severe health problems, and even death. There are more than 1 million deaths every year attributed to kerosene lamps; 62% of the people who die are under the age of fourteen, according to the World Health Organization. Kerosene lamps are also responsible for at least 100 million tons of carbon dioxide emissions annually. By comparison, Little Sun uses the natural energy of sunlight to shine bright. Each Little Sun measures a diameter of 12 cm, a depth 3.2 cm and weighs just 120 grams. The hand-held lamps are constructed from a sturdy plastic that is both highly weather and UV resistant. Its convenient shape also allows it to be used as a table or pendant lamp or as a hand-held lantern at night, and it can be easily carried during the day or hung outside in the sun as it charges. A compact 60 x 60 mm mono crystalline solar panel is embedded on the back of the lamp and is capable of charging three AAA batteries that power Little Sun’s 40 lumen LED for 5 continuous hours — the lamp’s brightness is comparable to a 40 W incandescent light bulb. The lamps will last about three years, at which point only the batteries will need to be replaced. The cost of one Little Sun lamp offers a 90% savings over 3 years as compared to kerosene lamps. The ingenious design has far-reaching effects, providing light to people in off-grid locations so that they can work, study, keep shops open late, walk the streets safely at night, reduce household expenses and more! So how does the Tate play into all of this? Visitors to the Tate will get to experience the Little Sun first-hand in Eliasson’s brand new interactive exhibit. Every Saturday for two hours, the lights of the former power station are shut down and museum guests are welcome to roam the halls filled with surrealist works by the light of the Little Sun. 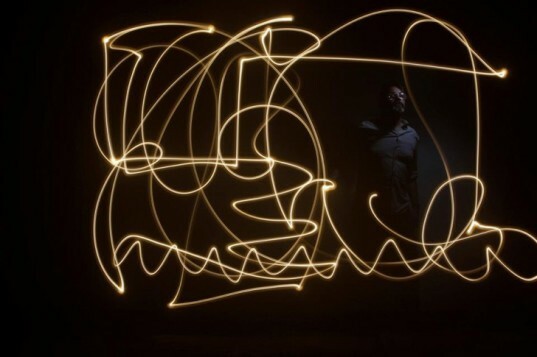 In addition to a chance to view the museum’s collection in a different light (literally), guests are also invited to a dedicated space to create “light graffiti” using Little Sun. The graffiti is documented on a computer for newfound “artists” to enjoy after a creating a light spectacle. Beyond the Tate Blackout events, the exhibit will also host a space on the third floor of the gallery where visitors can learn about solar power, the global energy challenge, light and its importance in and for life. The Tate will also host seminars and premiere 16 short films on light, life, and Little Sun by filmmakers from off-grid areas around the world. Visitors are offered the opportunity to buy a lamp for £16.50 (the lamp will be offered at half that price to off-grid communities). Speaking about the exhibit Eliasson said: “Light is for everyone – it determines what we do and how we do it. 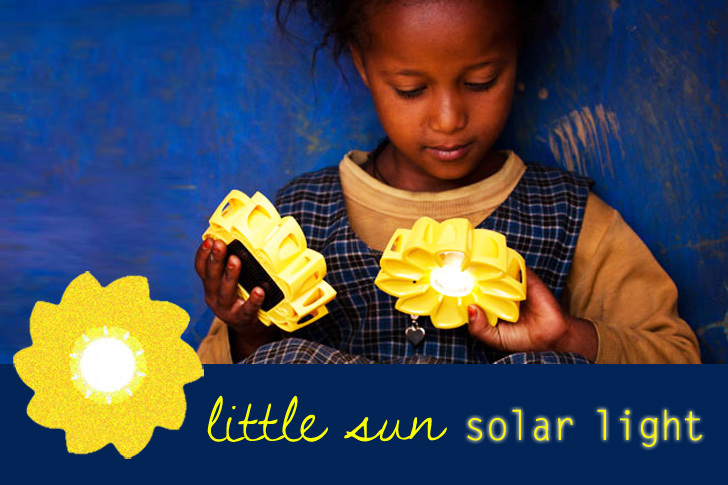 This is why Frederik Ottesen and I have developed the solar-powered lamp Little Sun. One part of the artwork is the lamp and the activities it enables. The other is the successful distribution of Little Sun in off-grid communities, its journey from production to usage. The Olafur Eliasson: Little Sun exhibit will run from July 28 to September 23 at the Tate, and Tate Blackout nights will be hosted for two hours, after museum hours, every Saturday until the exhibit closes. For those that can’t make it all the way to London, the lamps can be purchased online by those in the US through the Little Sun website for $25. By purchasing a Little Sun at full price, you will help make it available at a lower price for those with little or no access to electricity. This content series is brought to you in partnership with smartwater. smartwater, good taste travels well. To learn more clickhere. I went to experience Little Sun at Tate Modern and really enjoyed using the solar-powered light to look into the paintings´details and doing some light graffiti was so much fun! I really hope this amazing social and economic project can help some of those 1.6 billion people living in off-grid locations! I just bought one at the Tate Modern last week! What an inspiring way to use art to make a positive change! Great example of where need meets design! Smart and simple design! love it! Love the design of the Little Sun, and I wish I could check out the new exhibit! Such a smart, accessible design. Solar FTW! Eliasson's past works are hard to top but Little Sun is my favorite by far. Those flower lights are adorable! Awesome project and love that the Tate is doing the blackouts. Wish I could be there to be part of it! The ability to switch on a light is something that many of us take for granted, but more than 20% of the world is left in the dark when night falls. With 1.6 billion people lacking access to electricity, few solutions exist for these often impoverished individuals to gain access to lighting that is affordable, reliable, and above all, safe. Recently, Artist Olafur Eliasson and innovator Frederick Ottesen released Little Sun, a portable solar-powered lamp capable of providing five hours of continuous light. While the little lamp is being distributed for use worldwide, Eliasson decided to join forces with the Tate Modern Museum in London to promote the new lighting innovation to the public. 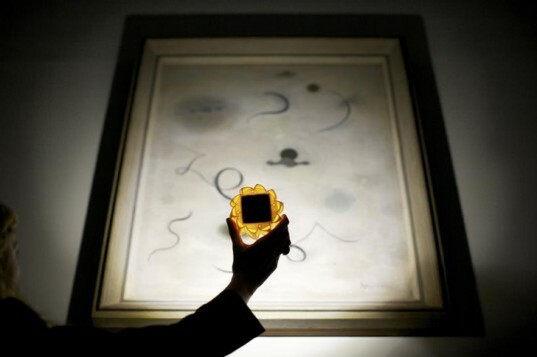 In an interactive exhibit where art meets technology to improve living, the aptly dubbed 'Tate Blackouts' invite vistors to experience art in the Tate's suite of surrealist galleries using only the Little Sun lamps to light the way. While the lamps are being used far from their ultimate recipients, their use in this forward-thinking art exhibit poignantly provides a vehicle for the more fortunate to internalize what it means to live with little or no access to electrical lighting. We recently visited the exhibit in London — see some of our photos ahead and learn more about how Little Sun has the potential to bring new light and raise living standards for more than a billion people worldwide.